Off for a run? Don’t forget your rubber gloves and eye mask! With summer on its way, the streets of the Netherlands have reawakened with the sight of dusted-off trainers and lycra-clad runners but, as Rachel Kilbee has been finding out, there are some new necessities for the everyday runner to consider before lacing-up. Plogging – No, it’s not a typo — it’s definitely ‘Plogging’ and it’s the latest craze that is spreading it’s environmental arms across over 40 countries, with the Netherlands taking up the baton with fervour. ‘Find a group of people to do it with. The more of you there are, the more fun you will have, you’ll clean up a bigger area and feel more productive pushing each other,’ says Erik Ahlström, founder of Plogga in Sweden where it all began. So what exactly does Erik want us to do? ‘It’s a treasure hunt!’ he said. The concept is simple — you run around your local area, collecting rubbish in a bag as you go. It’s cardio exercise with an added bonus of complimentary squats and lunges whilst you litter-pick. 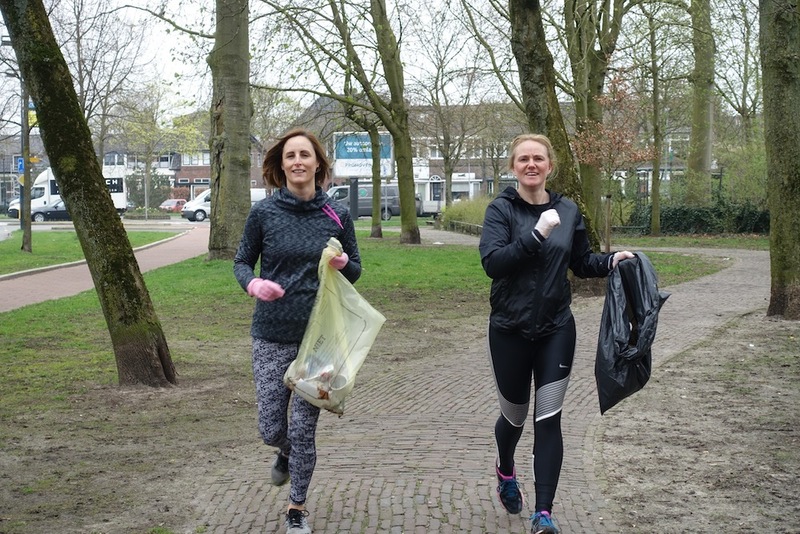 With over €200m spent annually in the Netherlands for cleaning up litter alone, there is certainly scope for this fitness concept to become more than just a trend. A local group that recently took to the streets of Hilversum were amazed by the results. ‘Initially I felt self-conscious, I don’t usually run through town with my rubber gloves on! But it’s a community spirited thing to do, and I’d definitely do it again!’ said Liz Young. ‘After a while, I didn’t even realise I was doing it. It’s a fun thing to do with friends!’ agreed Sanna Rantala. Is your mind running away with you? 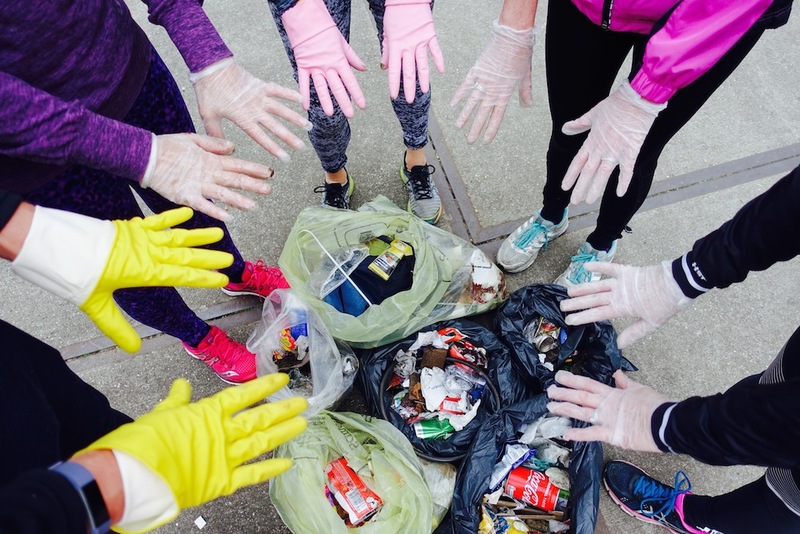 If picking up rubbish is not your thing, how about mindful running instead? Donning an eye mask may not seem the usual running attire, but in combination with sticky tape affixed across your mouth the concept may initially strike runners as somewhat bizarre. However, there are currently 170 active mindful running groups across the Netherlands demonstrating that the idea is being embraced with zeal. Ilse Loo, who is just beginning a 5-week mindful run course, realised that she was looking after her body with plenty of exercise, but in today’s busy world she was often forgetting to take a rest for her mind. After wearing the eye mask for an exercise in mindful trust, she suddenly had a flashback to 35 years ago. Mindful Run has been established for two years and in that time the concept has spread from the Netherlands to Belgium and Germany with interest also coming from Britain. ‘You come to us and mindful running gives you what you need. I don’t ask personal questions, I just give my clients the tools they need to deal with it,’ says Martijn.